The Athens public transport organisation OASA on Friday said that it expected its budget deficit at the end of 2016 to be significantly smaller than the 77-million-euro target agreed and approved by the institutions. An OASA announcement said that the deficit of the transport companies in the group was expected to be lower "in spite of the difficult circumstances generated by obligations 'inherited' from previous administrations and a gradual reduction in state subsidies." Among such difficulties it listed the absorption of a 10- and then 11-percentage point rise in VAT (from 13 pct to 24 pct) and additional spending on new projects that were in progress, such as the introduction of telematics. OASA said that figures for the first eight months of 2016 showed a deficit of just 34 million euros, or roughly 44 pct of the annual target agreed with the institutions. The group on Thursday announced higher revenues in August (5 pct) and September (3 pct) compared with the same months in 2015, due to higher sales of travel cards in August and total tickets in September. The overall increase in revenues for the two months was 1.1 million euros. 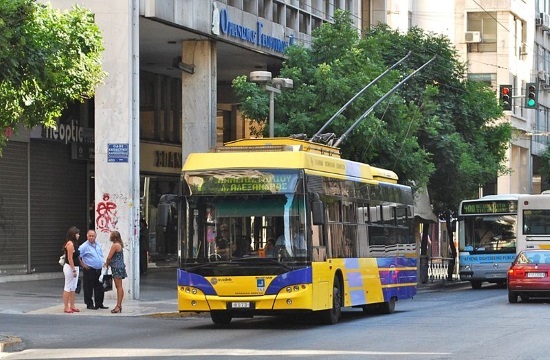 According to OASA CEO Ioannis Skoubouris, the higher revenues largely reflected improved transport services offered by OASA after the introduction of telematics in buses and trolleys, which were warmly embraced by the public. He predicted that the introduction of electronic tickets in 2017 and a reorganisation of bus lines will bring even greater improvements to OASA services. In its announcement on Friday, OASA noted that the 2016 budget figures were drawn up using different data and were therefore not directly comparable with the data for 2015. Such differences included the higher VAT rate, which existed for only four months of 2015 and free travel for groups such as the unemployed, which was only in force in the second half of 2015, as well as an additional 204 staff returned to their jobs through court decisions. The group's accumulated arrears to third parties came to 190 million euros at the end of 2015 while state subsidies fell from 182 million euros in 2013 to 100 million euros in 2014, rising to 108 million euros in 2015 and were predicted to fall to 86 million euros in 2016.